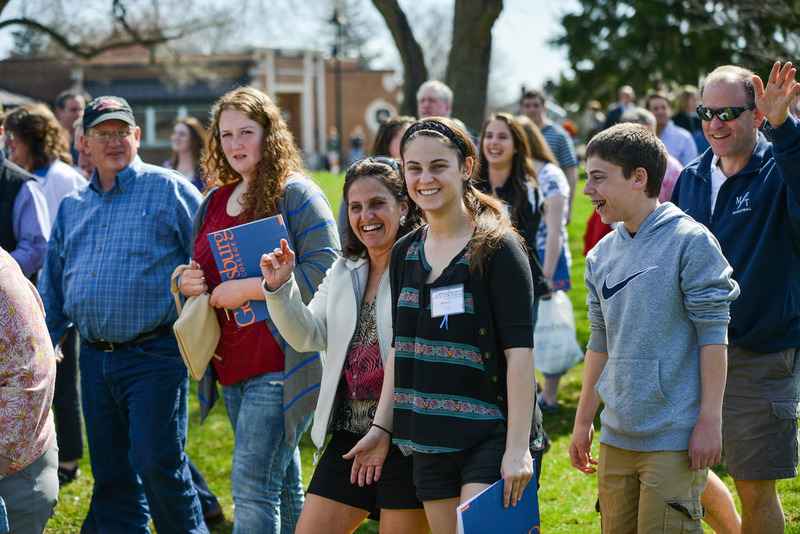 College welcomes Class of 2018 students with Get Acquainted Day | The Gettysburgian. The Gettysburg College campus was particularly crowded this past weekend. Hundreds of unrecognizable students milled about with their families, dressed in dark navy blue t-shirts, excitedly waving and shouting about Gettysburg College. The upcoming Class of 2018 explored the campus as they checked out their future home. Get Acquainted Day is the chance for newly accepted students to come get a glimpse of what campus life will be like. High school seniors arrive early Saturday morning to register and learn about the opportunities that await them at Gettysburg College. The Friday evening preceding Get Acquainted Day featured sociable cocktail events for students who acquired an academic scholarship, but is just a precursor for the main event. Approximately six hundred families registered and attended the event-filled day. Upon finding parking, prospective students and their families are directed towards the College Union Building where they register for Get Acquainted Day and receive a name tag. Students who have already decided, or just decided on that day, get an orange dot sticker on their name tag. These students, as excitedly advertised on the backs of t-shirts and banners, ‘got the dot’ and are committed to coming to Gettysburg College. For students who are not so sure, there is a Clubs Expo fair in Bream that displays the organizations and activities students have to offer. There were about one hundred organizations, clubs and departments present at the fair. After the fair, students and parents are given personal and guided tours by admissions and volunteer tour guides. Newly accepted students are encouraged to go to Servo for lunch at their leisure. Other activities such as panel talks featuring professors and students from respective departments, campus assets like the Career Development Center and pre-medicine advisors, and opportunities to mingle with future classmates at the Attic are popular events throughout the day. Anna Baldasarre ’14 was the Admissions Intern in charge of GAD. “I think the day went really well, and we are all excited to welcome the Class of 2018 in August!” said Baldasarre about her experience with planning the event.